The image below is borrowed from this blog post at The Wall Street Journal. Here’s my main point: the Fed is not succeeding in reducing the size of their balance sheet. They are happily letting it grow, buying more mortgage backed securities, more than are paying off or defaulting. 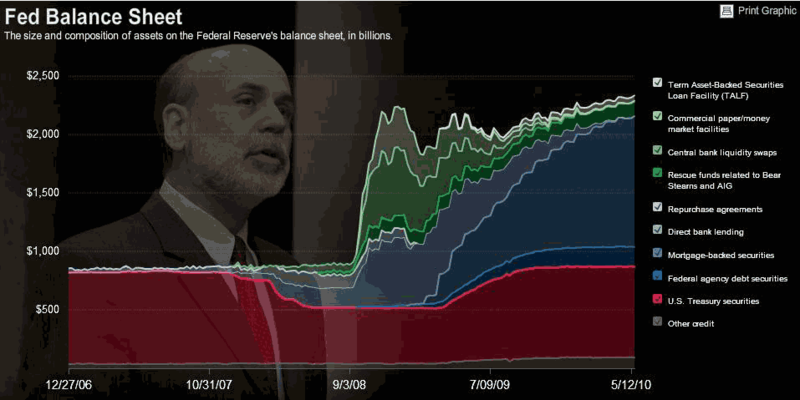 The Fed’s balance sheet is now at a record size. I have argued in the past that the Fed is not likely to remove stimulus prematurely. We have the bad providence that Ben Bernanke is Fed Chairman, and has the wrong view of the Great Depression, and also the wrong view of monetary policy. He will leave rates low for too long, and buy long duration assets for the Fed, and be reluctant to sell them. In absence of a commodity standard (which would be a very good thing), monetary policy should act to preempt high growth in debt. If debt across the economy is growing at more than twice GDP growth rates that is a time to raise rates, and make it hard to borrow. I realize at a time like now, this makes no sense, but had we adopted it in the 70s or 80s we would not have the present crisis. In a fiat money/credit world, evil as it is, monetary policy is credit policy. The issues become clear at the bust, but the prescriptions work best before the boom starts. The Fed always delays trouble in the modern era. Slow to tighten, quick to loosen. No wonder that we built up a mountain of debt, because the Fed would always ride to the rescue of crises, but never let the pain settle in that would liquidate poor investments. We need fewer banks, fewer homebuilders, and fewer auto companies. But guess what we bailed out? We bailed out the very things that were the least productive in our economy, and taxed those more productive to do so. Monstrously dumb. So when the market corrects because there has been no effective change in economic policy that would allow for elimination of bad debts, and shrinkage of bloated industries, we should not be surprised. Government stimulus can only do so much. The markets incorporate the stimulus, and they move on. Those stimulated gain, and taxpayers/moneyholders lose, but the markets move on. In the two-dimensional Fed where they offer credit to banks, and buy long assets as well, the Fed can’t be considered to be tight when the Fed funds rate is under 1/4%, and they are still sucking in long duration paper. The Fed is engaged in an operation to support asset prices, which may fail when goods prices begin to show some life, regardless of whether the CPI agrees or not. Monetary policy needs an anchor like gold, and people need to stop looking to the government for prosperity; the government can do little to achieve prosperity, aside from laying down a consistent set of rules. Prosperity is in the hands of the culture, and productive cultures that take on little debt will tend to be prosperous. 1. The orange line is the LIBOR slope: 3 month US Dollar [USD] LIBOR minus overnight USD LIBOR. 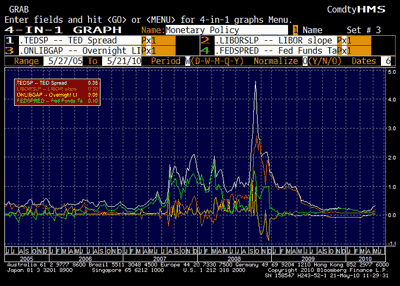 LIBOR is a rate that banks will supposedly lend to each other at unsecured for short amounts of time. As the LIBOR slope gets higher, banks are less willing to lend to each other. 2. The yellow line is the Overnight LIBOR gap: it is overnight USD LIBOR minus the Fed funds target. This measures how much banks need overnight money through sources outside of Fed Funds. 3. 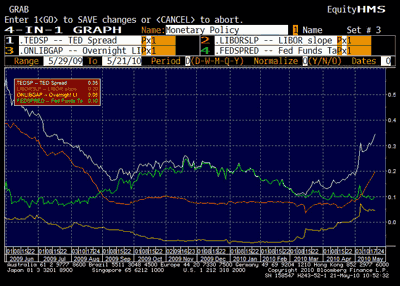 The green line is called the Fed spread: it is the Fed funds target minus 3 month T-bills. It measures how tight Fed policy is versus the ability of the US government to fund itself on the short end. The Euro is an experiment, but so is unbacked paper money. Both are undergoing a lot of stress at present; it will be interesting to see if either survives.